A cook is "a person who prepares food for eating" according to the Merriam-Webster Online Dictionary. A lead cook is the person who is in charge of other cooks working in the same place. This could be one other cook or several additional cooks and kitchen workers. 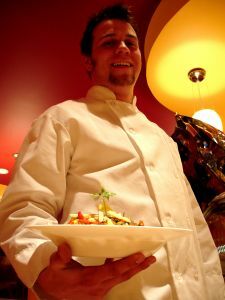 A lead cook can find a job in various places and advance with experience and additional education. A lead cook may work anywhere food is prepared. The job descriptions vary, depending on the specific employer, but many provide the same basic functions. Responsibilities include creating menus, dishes and serving amounts plus supervising the preparation, flavoring and cooking processes. It could also consist of ordering food supplies and equipment, making schedules, setting prices, organizing records and tracking cost percentages. Lead cooks are among the foundations of the food service industry. They work with chefs, other cooks and kitchen employees preparing or directing meal preparation. A lead cook could also be known as a head cook. A superior cook can help make any establishment success. According to the Bureau of Labor Statistics, U.S. Department of Labor, Occupational Outlook Handbook, 2008-09 Edition, the median yearly salaried earnings for food service head cooks in May 2006 was $34,370. Lead cooks may work in kitchens that have all of the latest equipment, climate controls and large working areas. Or they may work in an old, outdated, hot cramped environment. A lead cook may have a set schedule but will often work long hours, weekends, holidays and special events. This is especially true if the job includes supervising deliveries, menu planning and meal preparation. They must be able to stand for many hours, lift heavy items, direct others and communicate effectively. Lead cooks may begin working as entry-level cooks and then be promoted, but further training and education is typically required. Education can begin in high school through vocational programs and continue through internships at restaurants or chef-mentor training. Other sources of education for lead cooks include professional culinary institutes, private cooking schools, military services and two- or four-year college degree programs. The training and further education occurs in a real or "like real" kitchen setting with accompanying classroom courses. Lead cooks who want to advance should receive additional training. The job outlook for a lead cook is good, expected to increase and has many potential advancement opportunities. This depends on the further education, training or certifications received. It also requires the ability to handle more responsibilities and the eagerness to learn new or additional skills. These qualities open possibilities to work in larger or more prestigious kitchens or restaurants. Many lead cooks can become chefs and move up in the same establishment or move on to a better job elsewhere.